Lachy Reid is an outstanding MC and auctioneer who will delight and engage any audience. At the age of three Lachy Reid began commentating cricket, basketball and footy games. Unfortunately the broadcasts never went to air but he still has the cassette tape as proof! Twenty years later he finally became a sports reporter. Lachy’s media career began in radio whilst studying Broadcasting at Western Australian Academy of Performing Arts (WAAPA). He has completed more than a decade at Channel Ten Perth, in the role of senior AFL football Reporter/presenter and has won several awards for best news and feature stories, presented by the WA Football Commission and the National Basketball League. Lachy is an accomplished commentator on various sports on television and radio, commentating for NBL Basketball and Swimming on Network Ten. He was a part of the station’s Winter Olympics coverage in Sochi, commentating alongside Olympians Steven Bradbury and Steven Lee. Lachy called all heats and finals of the Swimming at the Glasgow Commonwealth Games in 2014, with expert commentator Nicole Livingston for Channel 10’s live and exclusive coverage. He also called Michael Phelps’ return to swimming at the 2014 Pan Pacs on the Gold Coast. Lachy also calls AFL and WAFL on ABC radio. Renowned for his live comparing, he has made a name for himself as courtside announcer in over 10 seasons for the Perth Wildcats, whilst adding to his ever-growing MC portfolio. Lachy Reid will bring, humour, enthusiasm and second-to-none professionalism to any event. "Lachy Reid is an outstanding Master of Ceremonies and auctioneer. He is one of the talented few, able to raise funds for a deserving charitable cause and yet still keep the event fun, on time and in the right spirit." "Lachy's enthusiasm was outstanding and he was a pleasure to watch being our MC for Channel Ten's "Intensify Your Brand" program. Lachy made our sales pitch a lot easier." Danny Lavell. Channel Ten, National Direct Sales Manager. "Lachy was very professional in his approach to the MC and Auctioneer duties but with a great sense of humour. He was very personable and connected well with the audience. He also worked very hard in getting maximum dollars in the auction for our cause and I would be very happy to use Lachy again on an ongoing basis." Dee de Vos. Event Coordinator, Senses Australia. 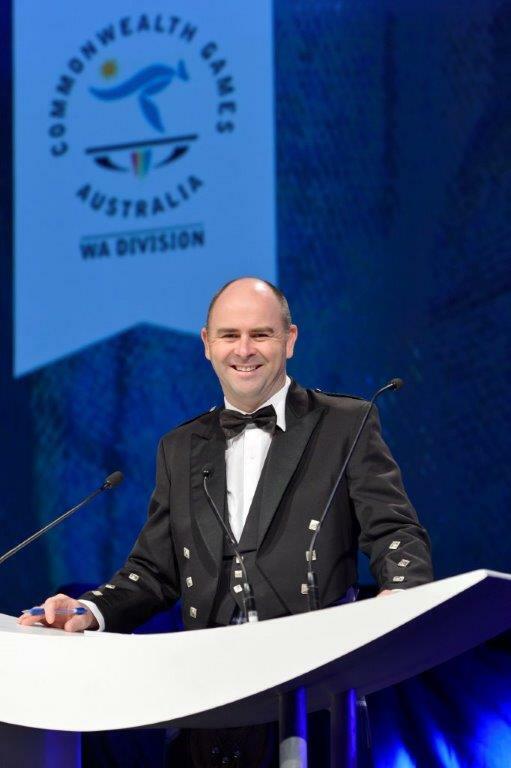 "I've used Lachy Reid as my MC for many events now but more recently Lachy hosted our 'One year to Go' event for the 2104 Australian Commonwealth Games Team. Lachy is always professional, humorous and can quickly engage my corporate audience and guest Olympians, Commonwealth Games athletes and younger aspiring athletes." Amanda Gohr. Executive Officer - Marketing, Promotions & Fundraising. Western Australian Olympic Council & Commonwealth Games Association.